Girl Scouts of the USA has seen 100 new members in Fulton County over the past two years. As a 106-year-old institution, it has faced contenders over its lifespan but survives on its resolve to help young girls become independent, successful women. And though Girl Scouts of the USA (GSA) has lost part of its foothold in Fulton County to other interests, 300 current members in 27 troops are keeping the spirit of the iconic organization alive locally. “It’s a very important program because it helps to encourage girls to become strong, independent-thinking young ladies,” said Patti Leach, chair of the GSA Great Oak service unit that includes the area. Numbers had decreased in Fulton County, but under Leach’s guidance over the past two years 100 new members have been recruited. She admits, however, that the competition has grown. Leach has also found it difficult to recruit leadership, “(having) parents who don’t have the desire to step up,” whether due to their work schedules or simple disinterest. She said the presence of GSA in the county had waned when she took her present position two years ago, a victim in part of extracurricular school activities, 4-H Club, and technology. “It was just kind of in a lull. It wasn’t prominent,” she added. Leach said her main goal is to reinvigorate GSA locally, despite the competition. She said she wants young women to have the plethora of opportunities the organization has offered since it was formed by Juliette Gordon Low in Savannah, Ga., in 1912. Nationally, there are 1.8 million members. 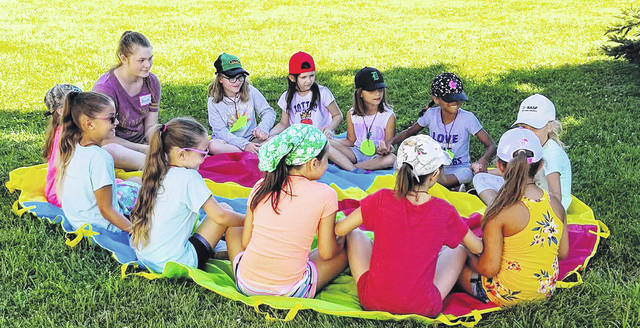 This past summer, 50 local Girl Scouts attended a week-long day camp at the Fulton County Sportsmen’s Club in Wauseon. The camp provided activities that included archery, outdoor cooking, and hiking. And last year the organization introduced various Science, Technology, Engineering, and Mathematics (STEM) related badges to earn. “There are a lot of girls that are very interested in doing that type of activity,” Leach said. Beth Wyckoff is the leader this year of a dozen Girl Scout cadets in Troop 10248, based in Swanton. The girls, in grades 6 through 12, and from Swanton, Wauseon, and Metamora, are the oldest Girl Scout members in Fulton County. However, the troop may also begin accepting younger girls. Wyckoff, who also trains other troop leaders in the county, and covers lifeguard, small craft, and archery training, said as Girl Scouts get older they tend to lose interest. This year, she traveled with about half of her troop members to the Upper Peninsula in Michigan. Over several days they bicycled on Mackinaw Island, visited Pictured Rocks National Lakeshore along Lake Superior and Soo Locks in Sault Ste. Marie, and stood in awe of waterfalls at Tahquamenon Falls State Park. They also visited Oswald’s Bear Ranch, a bear rescue habitat in Newberry. Over the summer a troop member from Metamora attended a resident camp program open to all scouts in the Girl Scouts of Western Ohio council, which runs from northwest Ohio to Cincinnati. Troop 10248 also tries to plan family trips, and this winter may embark on an overnight stay at Camp Libbey in Defiance. All trips are funded mostly through Girl Scout cookie sale proceeds. The troop attempts to meet twice monthly to plan its activities. She said what’s important is that Girl Scout members are taught life skills many haven’t yet learned. When on trips, they are expected to shoulder their share of the responsibilities. “When I was in school, we learned a lot of these things in high school, how to cook and how to sew. They don’t get these things in school, and there’s a lot of households with parents who work two jobs,” Wyckoff said. “I think it’s very sad that we don’t teach our girls these things anymore. Leach said she launches a recruitment campaign as school starts each year, and posts flyers inviting girls from kindergarten through high school to attend summertime open houses.